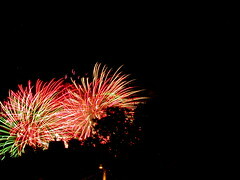 In the first few months after I began meditating, it was fireworks everyday. Big bursts of neurons transmitting ideas everywhere, synapse explosions like the Fourth of July topped off by a fluency of speech and ideas that delighted me and caught me by surprise. Not so anymore. Subtlety is an acquired taste, I suppose. I sit down to stillness and I feel relief and peace. In between the meditations there is the awareness of a connectedness, and that is a peaceful and satisfying knowledge.